Well, it's my first attempt at HDR. Not a whole lot of thought or preperation put into it... 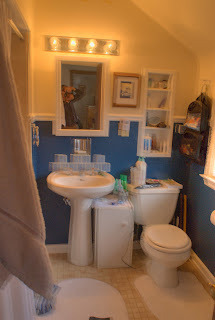 In fact, I installed the HDR software, thought it would be fun to try, picked up the camera and took 5 shots of the bathroom. As you can see, I am handholding the somewhat long exposures. Thus, the blurriness all around. I'm sure they'll get better! Neat! How did you get a hold of HDR software?